The development cooperation landscape is fast evolving; ODA definition is being revisited, to capture the entire breadth of development finance flows and contributions of emerging development actors. Monitoring and accountability become all the more crucial given these developments, not to mention the role of CSOs in ensuring the quality of development partnerships post-2015 through human rights based approach. 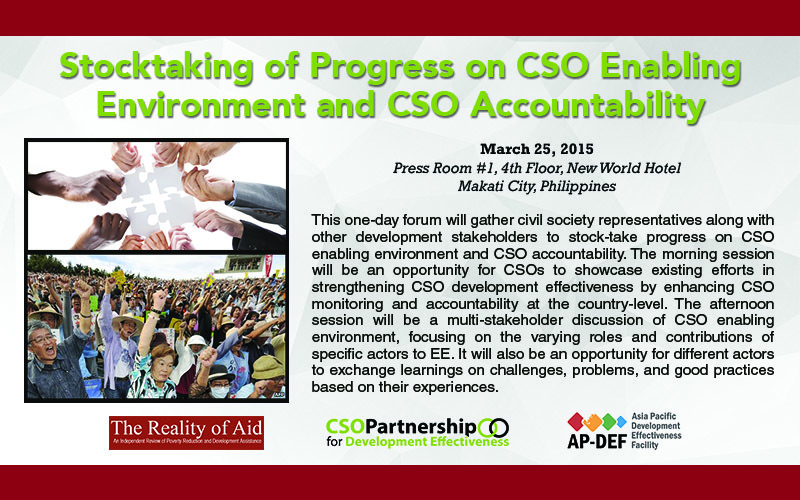 CPDE, ROA-AP, in collaboration with the Asia Pacific Development Effectiveness Facility, will hold a one-day forum on March 25 to stock-take progress on CSO Enabling Environment and CSO Accountability.